After a dismal first half, Manchester City made an impressive comeback to win the second leg of their Europa League tie against Sporting 3-2 on Thursday. They still lost on away goals with a 3-3 aggregate score because Joe Hart's nearly amazing last-second header was tipped just wide of the goal by Sporting keeper Rui Patricio. In the midst of City's frantic three-goal second half comeback, Sporting midfielder Bruno Pereirinha went down near the touchline with a dislocated shoulder. Though the injury wasn't caused by Nigel De Jong, he did try to make it worse by attempting to pick up the injured player like a giant baby in an effort to get Pereirinha off the pitch so play could continue. Pereirinha screamed in pain and disbelief as teammates prevented De Jong, self-appointed officer of the time-wasting police, from getting him off the ground. Nigel then stood over him and came to the realization that stomping on an already injured player isn't as much fun as kicking one out of the sky. 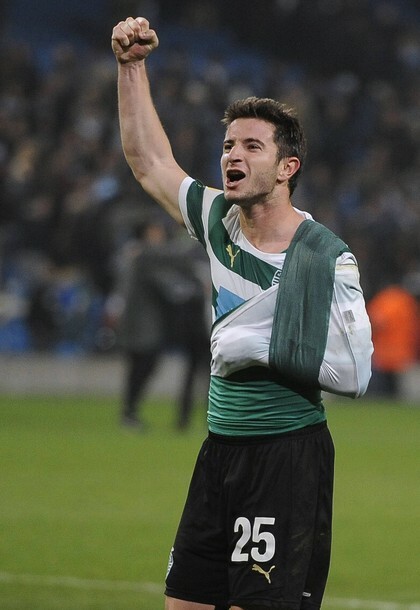 Pereirinha couldn't be subbed out of the match since Sporting had already used all three of their substitutions, so his arm was put in a makeshift sling. Special thanks to Fabio Penna of Bola nas Costas for the video!